For a High Country trip encompassing the three highest peaks in the San Gabriel Mountains and the grandeur and adventure of high mountains, this trip is a winner. The air is usually clear (and thin, if you're not used to 8 to 10 thousand foot elevations). The views are magnificent in all directions. Trees are scattered, gnarled, twisted and stunted from harsh winter winds. While narrow, indistinct and very steep in places, the trail is not dangerous if reasonable care is exercised. You should be an experienced hiker, in good physical condition, before attempting this trip. Do not go alone or when there is snow. Snow can be deep, icy and extremely dangerous. Part of the way is along Devil's Backbone, a narrow rocky ridge with slopes dropping off sharply on both sides. Carry water, as there is none along the way. Drive the Angeles Crest Highway about fifty miles east from La Canada and about three miles past Vincent Gap, to the dirt road to Guffy Campground and Prairie Fork. It branches off on the right (south) side of the highway, just as the highway leaves Blue Ridge for the two mile descent to Big Pines. You can also come in from Interstate 15 through Wrightwood and Big Pines if you prefer. Follow the dirt road about six miles (go past Guffy Campground road) to a road junction. Take and left branch (right goes to Prairie Fork, Lupine Campground and Cabin Flat), and go another 1.7 miles to a pass and a trail sign for Devil's Backbone. The trail leaves the road on the right side and drops steeply down for a short distance to a narrow ridge which is the beginning of the Devil's Backbone. From there to Mt. Baldy (Mt. San Antonio), the trail goes up and down almost reaching the summits of first Pine Mountain (9,648 feet) and then Dawson Peak (9,575 feet) before the final very steep climb to 10,064 foot Mt. Baldy, the highest point of the San Gabriels. 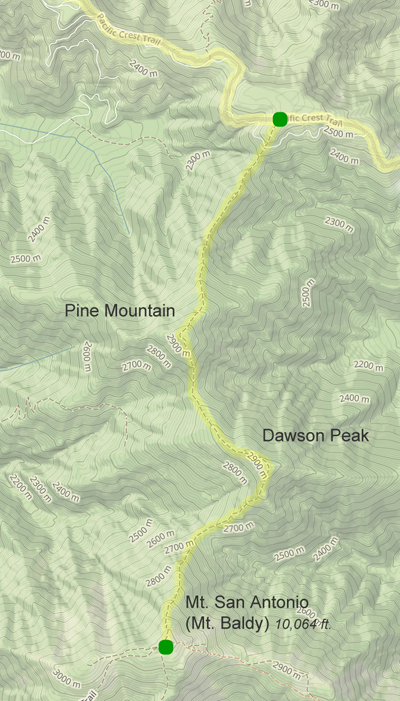 To reach the actual summits of both Pine and Dawson, you have to go off trail a short distance. If you don't want to return the way you came, you can go east from Baldy down to Baldy notch and then down either the ski lift or the gated fire road to San Anotnio Canyon road below. 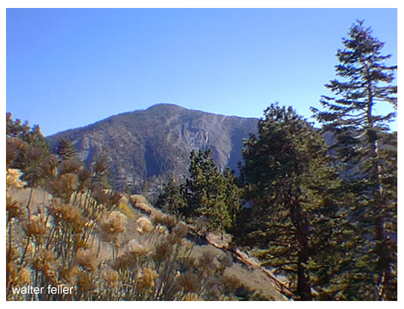 Another option would be to hike down the long Bear Canyon trail to Baldy Village. Don't try this last unless you are familiar with the route. Either way, of course, requires someone to drop you off at the trail head and later pick you up at the end of your hike. A National Forest Adventure Pass is required for your vehicle while parked at the trailhead.